The following morning the skies are a little grey. We have sailed through the night around the coast of Isabela and have arrived at Santa Cruz Island where we disembark to visit the Charles Darwin Research Centre and see the giant tortoise breeding programme in action. We see some baby tortoises about six weeks old who at such a tender age still manage to look ancient and wizened. Then we all head inland to the highlands of Santa Cruz which are lush in vegetation and very wet. In fact we are caught in the midst of a very heavy tropical downpour. Undaunted we carry on searching for giant tortoises but due to the unseasonably large amount of water everywhere they are dispersed rather than gathering around the watering holes and we only find a few chomping away on the greenery with their shells glistening in the pouring rain. After a fairly fruitless search we return to explore the town of Santa Cruz. Another choppy night and there are a few green faces as we head for the Island of Genovesa. I’m not sure if it’s the rough seas or the result of too much alcohol and bad dancing on the decks to the wee small hours of the morning. The sea breeze on the panga journey to Genovesa works its wonders and smiles soon appear as we see the mass of birdlife that unfolds before us. 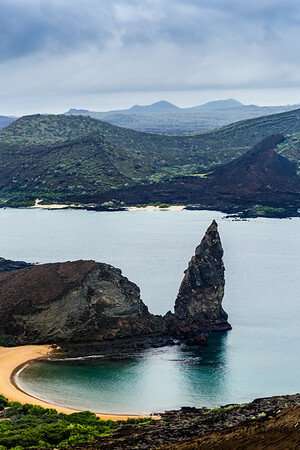 El Barranco, also known as Prince Phillip’s Steps, is a steep path with stairs carved into the rock, which leads to a plateau full of bird life among a palo santo forest. This I think has to be my favourite Island – boobies galore - what more could you ask for? Well for my part a working camera! Frustration mounts as we see blue-footed boobies courting everywhere and I can’t get any photos as my lens has fogged up as a result of yesterday’s downpour. I try another lens and that too is misted up. In these humid conditions all our lenses are suffering but finally after about 20 minutes of near desolation as I marvel at all the amazing birds performing fantastic rituals around me, and no working camera, my lens clears and I can start to capture some precious moments. Male blue-footed boobies are making fantastic whistling noises as they court the females who chatter back. Some are already sitting on eggs. 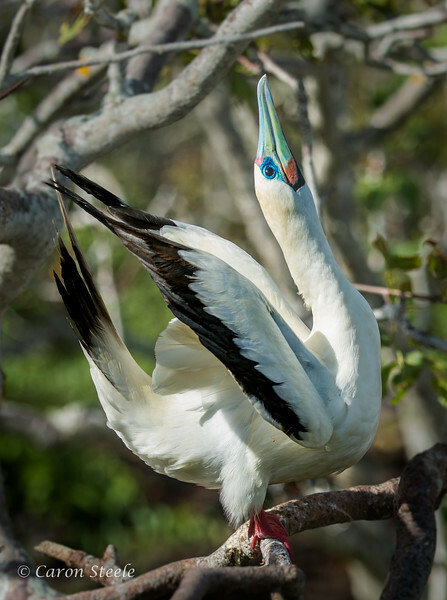 The red-footed boobies are even more colourful and have gorgeous pink and blue markings around their eyes. I gaze in awe of all the diverse bird life around me and then I spot the Ffigatebirds. Slightly late in the season they are still courting. 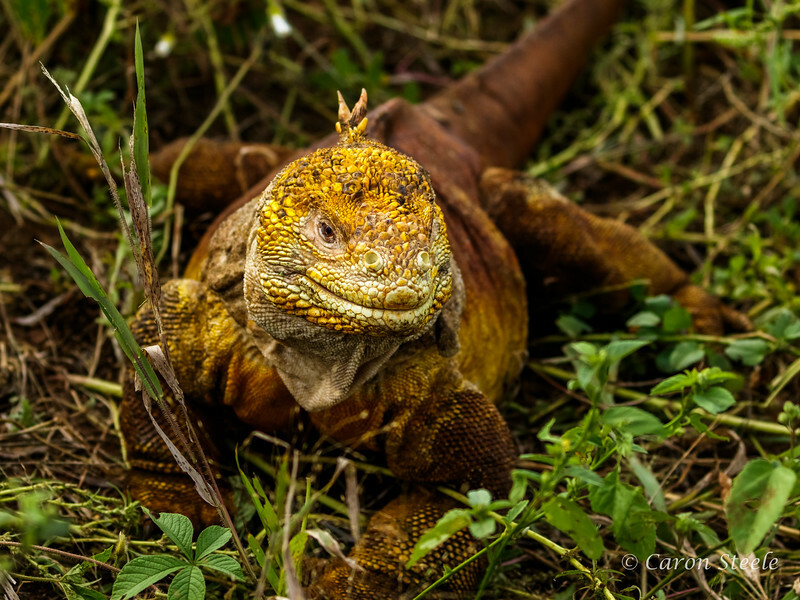 Males with their bright red gular sacs inflated sit in groups and call to the females. They have the most elaborate mating displays of all seabirds. They display to females flying overhead by pointing their bills upwards, inflating their red throat pouches and vibrating their outstretched wings, showing the lighter wing under-surfaces in the process. 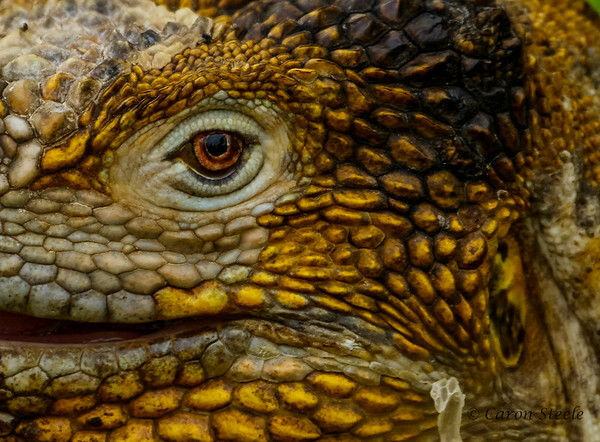 Their throat pouches or gular sacs take over 20 minutes to inflate by taking in sips of air. They also produce a drumming sound by vibrating their bills together and sometimes give a whistling call. The female chooses her mate based on this display and lands next to him. Seeing so many of them calling in competition as a female flew past was spectacular. 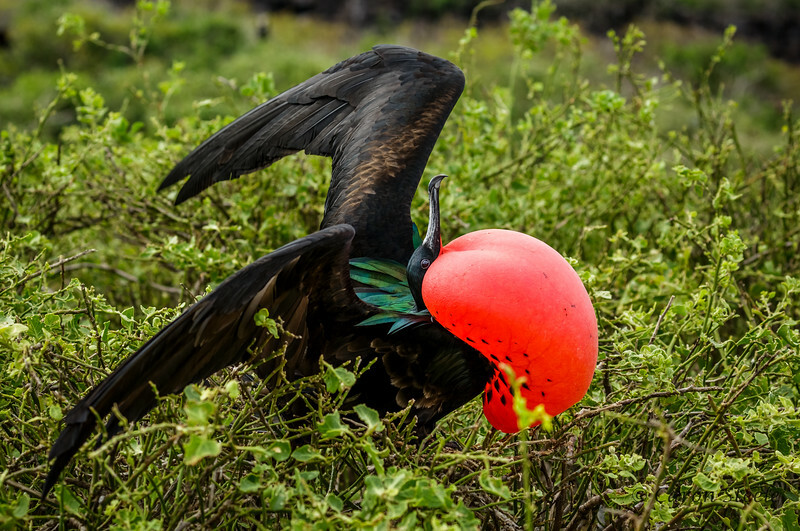 Just as we are about to head off I notice a male frigate bird swooping down and attacking another sitting on a nest. I thought it was just a passing swipe but then he settled in the bush and a serious fight ensued. We can only assume that the bird on the nest was guarding an egg to put up with such a savage assault. As the sitting bird opened his beak to call the attacker plunged his beak right down his throat. They battled ferociously for over three minutes pecking at each other and at one point we heard an ominous pop as if the gular of one bird was popped. The nesting bird however managed to defend his nest and the attacker finally flew off. We all let out a huge sigh of relief. 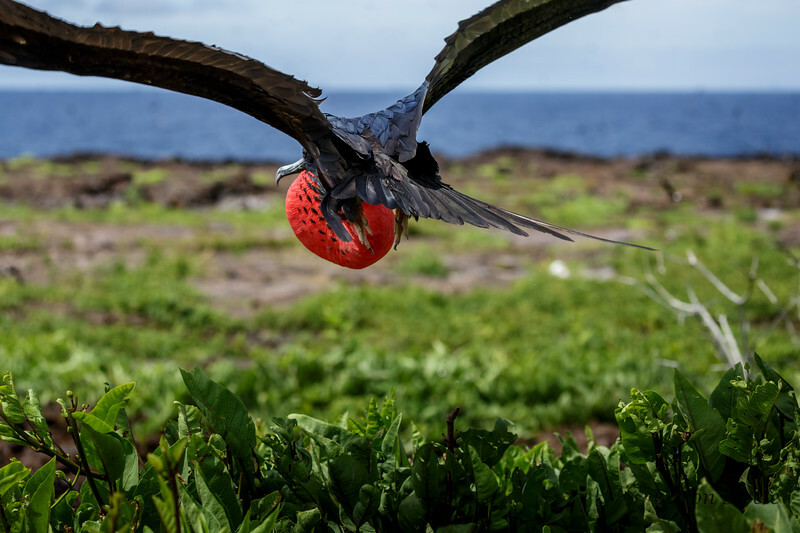 Frigatebirds usually produce only 1 egg and when it hatches the chick is fed by the parents for up to a year (although most of the feeding is left to the mother after the first 3 months). 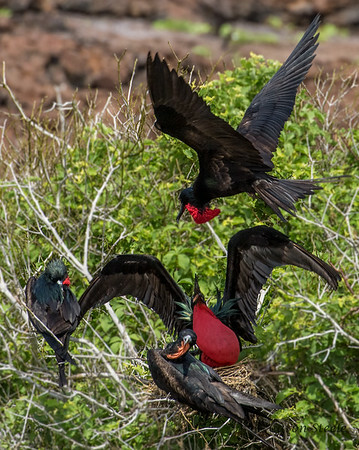 It takes so long to rear a chick that frigatebirds generally only breed every other year. 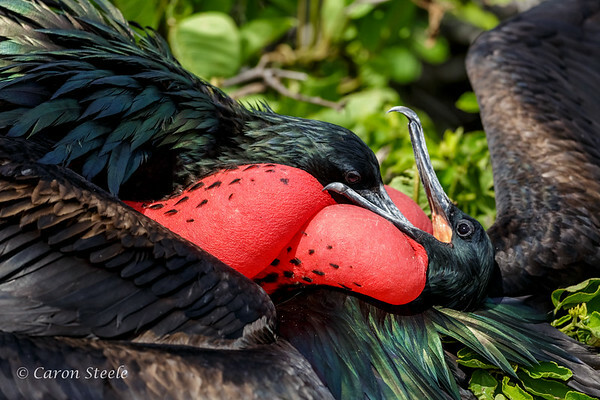 The duration of parental care in frigatebirds is among the longest known for birds. Given this high level of investment perhaps it is not surprising that the male should have defended his nest so staunchly. As our defeated bird flew off with his gular still inflated it seems amazing that he can navigate as his large red neck pouch bounces about in his face as he flies. 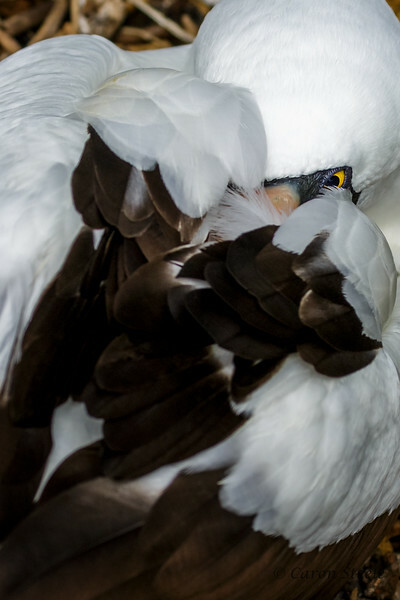 However having the largest wingspan to body weight ratio of any bird, they are essentially aerial, able to stay aloft for more than a week. This large wingspan of up to 2.3 metres, combined with a distinctive forked tale which enables them to steer in flight makes them makes them highly successful acrobatic birds in the sky. 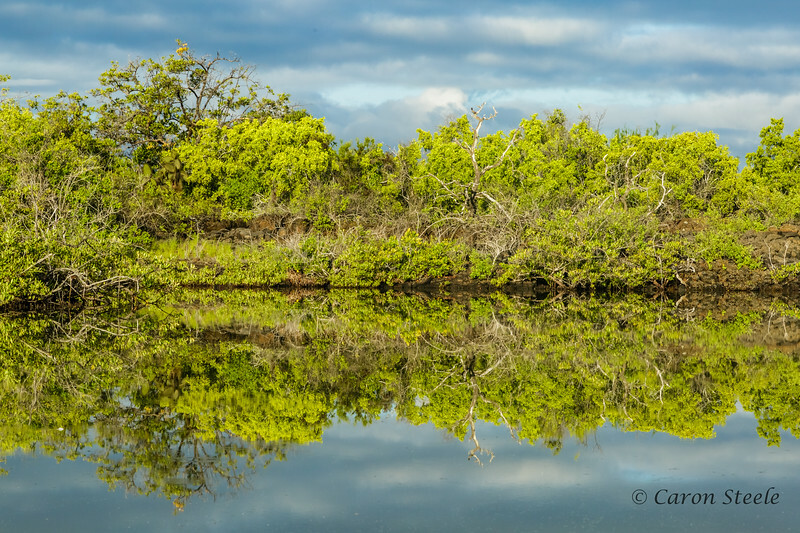 Later in the afternoon we visit Darwin Bay, a coralline white sandy beach leading into lush mangroves where more boobies and frigatebirds are nesting. Night herons fishing in the shallow inlets of water and sea lions are lying on the beach basking in the sun when we arrive. I stop to take some photos and have to back away as they approach and try to sniff my lens. The skies are cloudy and it starts to rain so we give up on our land excursion and take to the sea for a refreshing swim. The sea lions join us. 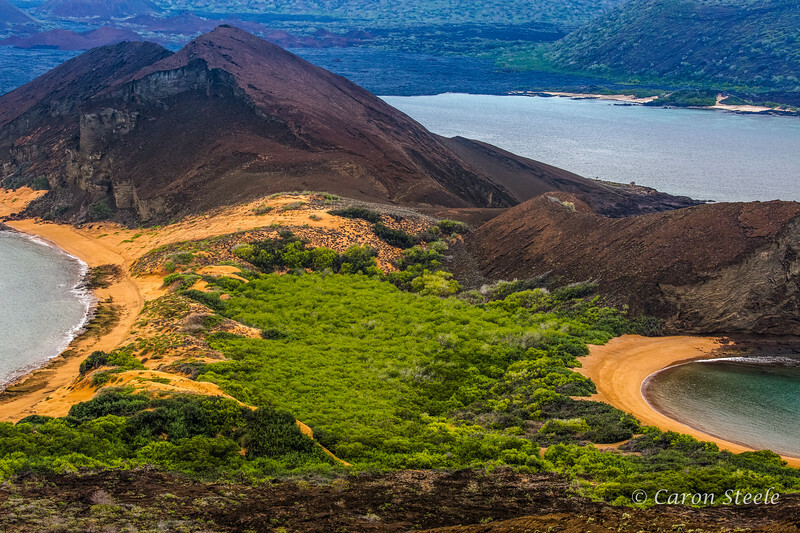 An early start the next morning and a vigorous hike up the peak of Bartolomé Island, gives us beautiful views of dramatically contrasting jaw dropping scenery and one of the most iconic vistas in the Galapagos of the Pinnacle Rock. After the hike we all feel we have earned our breakfast. After breakfast back into the sea for a snorkel. 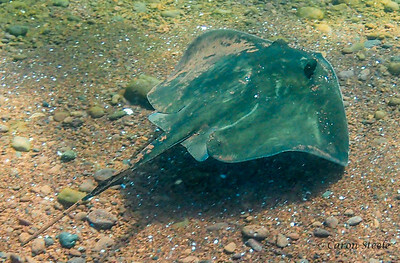 We spot more sea turtles and rays and below us the sea floor moves as an enormous school of fish swim by. Closer to the shore we spot a sea horse on the sea bed, larger than I expected it is about 8 inches long. We return to our ship for lunch and set sail for the island of Santa Cruz. Here we disembark and hike up Dragon Hill, aptly named because of its healthy population of land iguanas. It is hot and humid as we head out past the mangroves into the scrub looking for iguanas. Tall cactus trees are dotted across the landscape and the grasses are thigh high making spotting the iguanas quite tricky. We could see pathways carved through the grasses where they had recently passed. 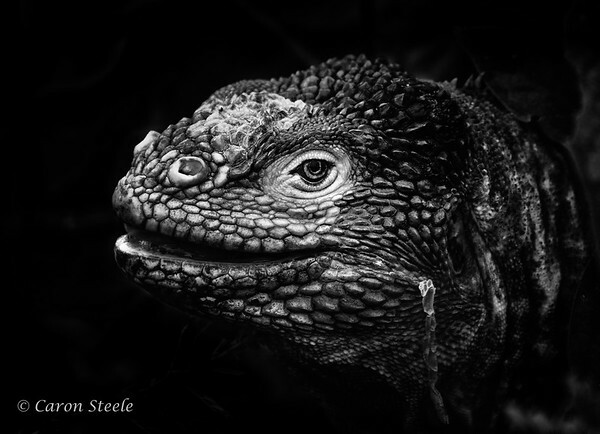 Soon we find a breeding pair and the female in particular has amazingly alert eyes. She also appears to be moulting. A mocking bird lands nearby and snacks on a piece of moulting skin, very little is wasted in nature. 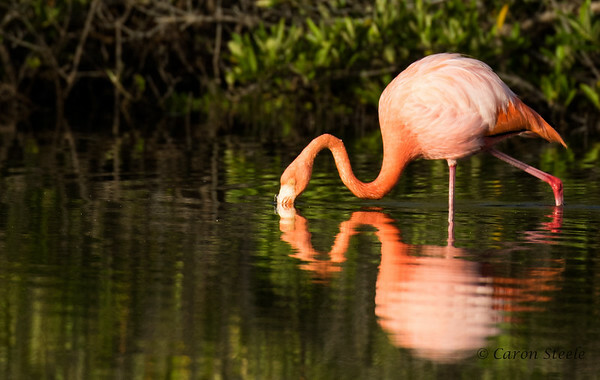 On our return we spot a lone flamingo that has landed in a small lake near the shore. Finally our last day has arrived. 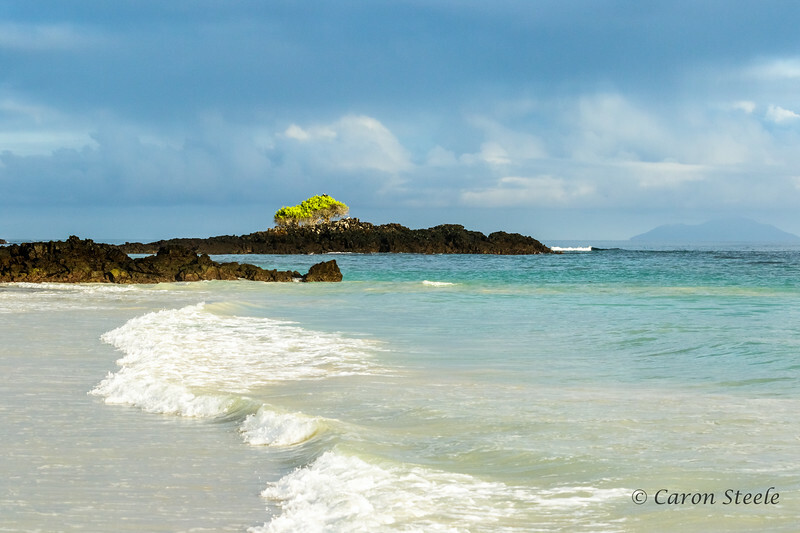 Although we partied into the early hours the night before and I have blisters on my feet from dancing barefoot on the deck, I struggle out of bed for a 6.00am start and a quick trip to Las Bachas Beach located on the North of Santa Cruz Island. I am so glad I have made the effort. This is possibly the most beautiful beach we have visited. The stuff of Robison Crusoe movies! The finest soft white sand oozes between my toes. It feels so heavenly and romantic, until my guide informs me that the sand is actually created by parrotfish grinding coral & coralline algae in their teeth and ingesting it. After they digest the edible portions from the rock, they excrete the rest as sand, creating this beautiful beach. 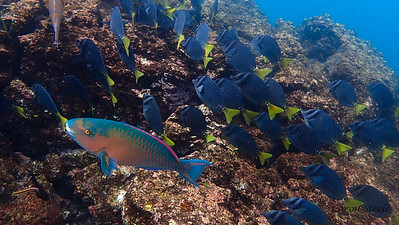 A single parrotfish can produce up to 90kg of sand a year- pretty amazing. So much for the romance…. I am in fact walking through fish poop! However, it still feels and looks wonderful. As we head down the beach we can see turtle tracks and have to tread carefully to avoid the shallow hollows which usually indicate nesting sites. 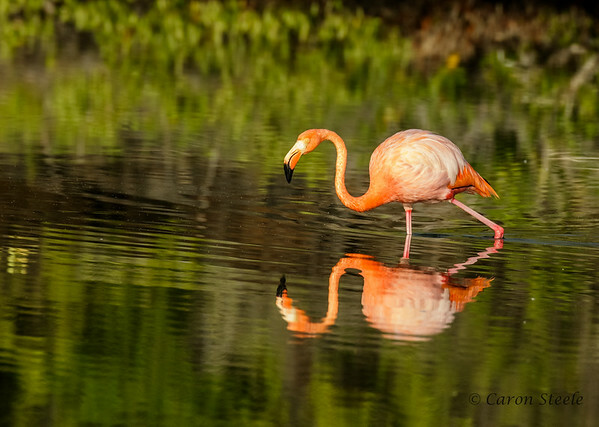 At the back of the beach through the salt brush is a small lagoon with two flamingos on it. A tear wells in my eyes as I realise that within a few hours I will be on my long journey home away from these enchanted islands. Time may have appear to have forgotten them but I never will. A return journey to see the rest of the archipelago is definitely on the cards. 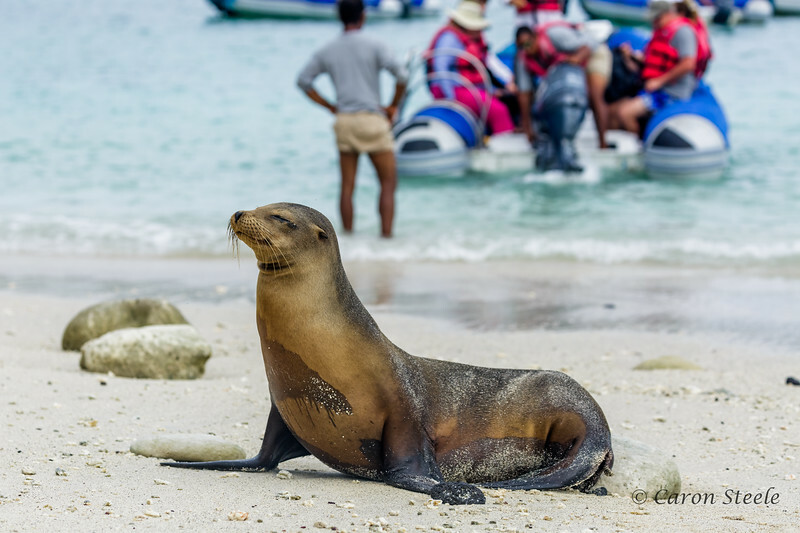 Created by nature and now conserved by man the Galapagos Islands are to be treasured. If you visit them you will fall in love. 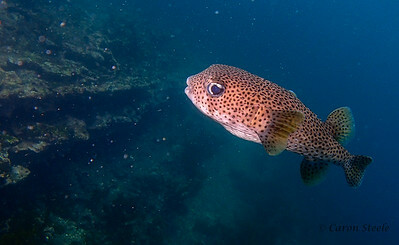 They are home to the Theory of Evolution and give us an understanding of our creation and as such should be cherished. I flew from London with Iberia via Madrid to Ecuador although with KLM via Amsterdam was also an option. Note that if you are on a budget but crave a luxury flight you can always book the economy fare with Iberia and bid for an upgrade, I did and got a business class flight for a fraction of the price. It is hit and miss and you only find out if you’ve been successful in your bid 5 days before you fly so be prepared to travel economy, however the upgrade was lovely especially on a long haul flight & I genuinely arrived far more refreshed and ready to go. Also buy some judo elbow pads and gardening knee pads to take with you – you might look a bit of a ‘plonker’ but they will save your skin on the harsh volcanic rock when you need to get down low for a good photo. Finally make sure you have a fully waterproof bag that can be submerged for your camera kit – and use it, several people on our trip lost expensive camera gear when endeavoring wet landings as waves crashed over us. I would also recommend getting some silica crystals to keep kit dry as it is quite humid. Also be aware that if you have the aircon on in your cabin your lenses will take up to 45 minutes to de-mist once out on deck so it’s worth getting them out before your excursion. I travelled with Natural World Safaris who were excellent and our boat The Eclipse was luxurious.